Lately I've been exploring more mountains, hills and trails in the Elizabethtown area. Saturday, my wife Leesa and I stumbled upon the Blueberry Hill Trail System purely by accident. We saw the sign pictured below and decided, as we drove past it, that we might as well take a look. I kind of expected this to be a small town trail system; a place to walk the dog, or take a 30 minute walk. It is much more than that. 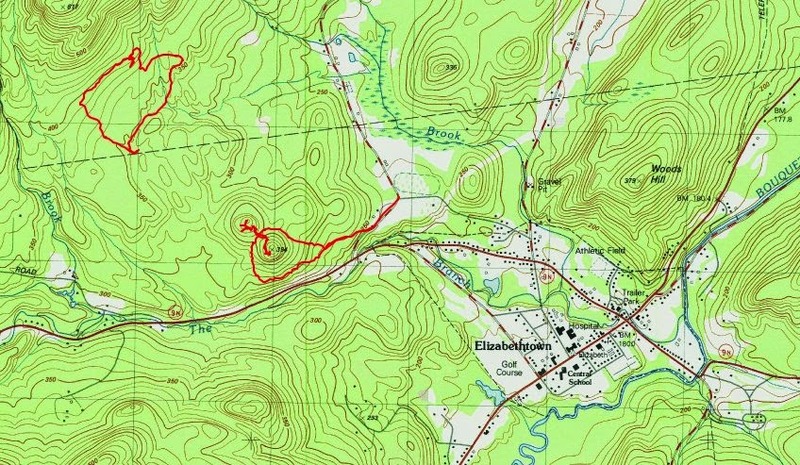 This trail system encompasses many hundreds of acres and there is a network of 30 trails that would take the better part of a day to explore (just look at the map below). You can download this map from the Elizabethtown website. There's lots to see on this trail system and lots of different types of terrain. It would be a great place for trail running as well. One of the things I liked best were the man-made features along the way; a lean-to on top of a Blueberry Hill, an old cabin, a sugar house. Lean-tos aren't usually on top of a ridge; they are usually down by a stream or a pond. This one has a great view east, south and west. The fastest way to the lean-to from the Lord Road trail head is to take the yellow (Col. Holst) trail to a right on the blue (Blueberry Hill) trail, to a left on the red (Lean-to) trail. It's probably 15 minutes to the lean-to, and it's a great spot. Be sure to get a trail map to take with you. After we went to the lean-to, we went back to the car to take a picture of the trail map (since we didn't have one). Then we drove over to the Bronson Way access and kiosk (they had trail maps there). We parked at the sand pit at the end of Bronson Way and headed for the cabin on Cabin Trail. It was an interesting style, but it doesn't look like it was used much after being built in 1996. After the cabin we looped around the "She Trail", and back to the car. We didn't go to the Sugarhouse. Next time we'll get there. Many of the the trails are old jeep roads. Some are trails. We were both quite impressed with this trail system and we will come back to explore more. Check it out when you are in the area. Lord Road is just off NYS Route 9N about one mile west of Elizabethtown. What wonderful spot -- that Blueberry lean-to.